Rustic bathroom decor ideas are among the first you’ll try when you decide to get your hands dirty, so to speak. Here are 35 gorgeous DIY ideas. 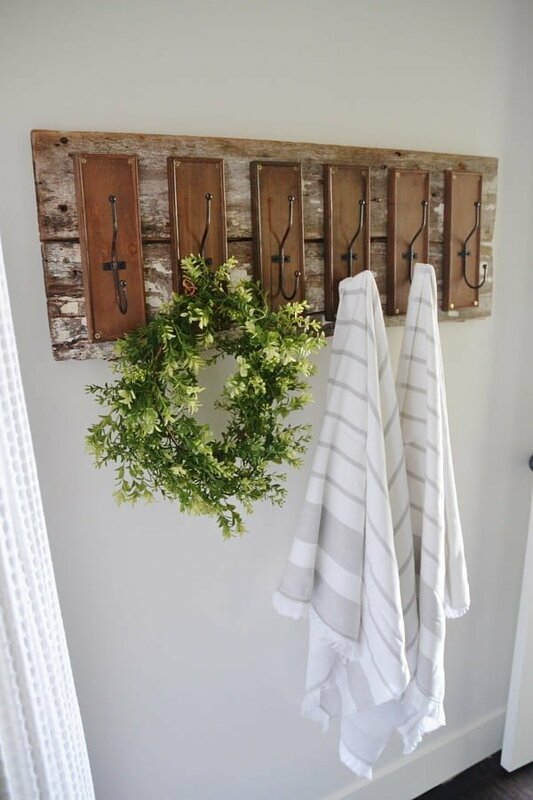 When it comes to DIY home decor, rustic bathroom decor ideas are among the first you’ll try if you decide to get your hands dirty. Rustic elements in the bathroom create an appealing impression of a complete decor, which often becomes whimsical and pleasantly surprising. Rustic style is appealing in many ways, mainly because it makes your home look warm and cozy. The style also makes it look like it’s handcrafted and unique. That’s precisely the kind of look you want to get when you decide to DIY your decor. 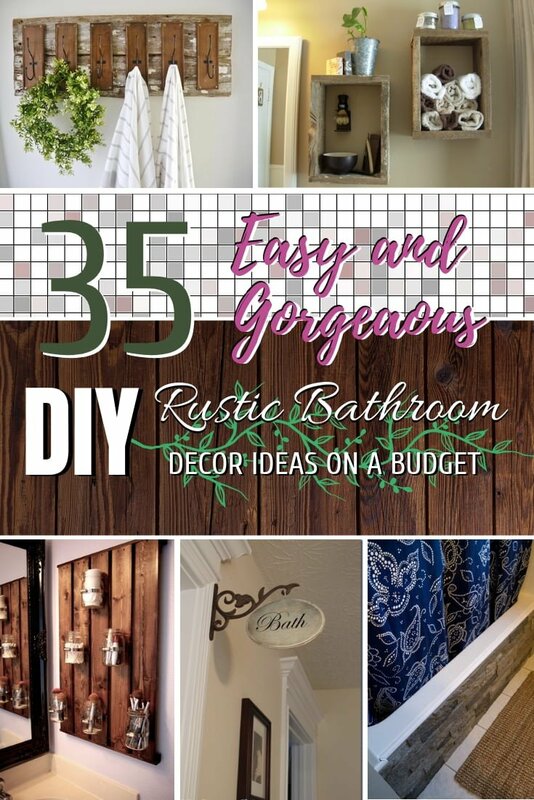 So why not try making something gorgeous to decorate your bathroom with some of these 35 ideas. Your bathtub will look so much more visually appealing if you cover the standard white tub with the airstone. As a material it is light and visually looks like real stone. The effect is an authentic rustic farmhouse bathroom stone bathtub that will surprise your guests. Cutting and screwing a couple of reclaimed wood boards don’t take long and the look you get by building these box shelves for your bathroom is authentic. It comes in a rough, rustic style which is as warm as it is whimsical. We don’t have the plans to build this rustic organizer, but if you’re crafty enough, you can figure out how to create it from pallet wood (if you do, drop us a line, and make some money). The organizer is very functional even in small bathrooms, and it comes with a lot of rustic appeals. 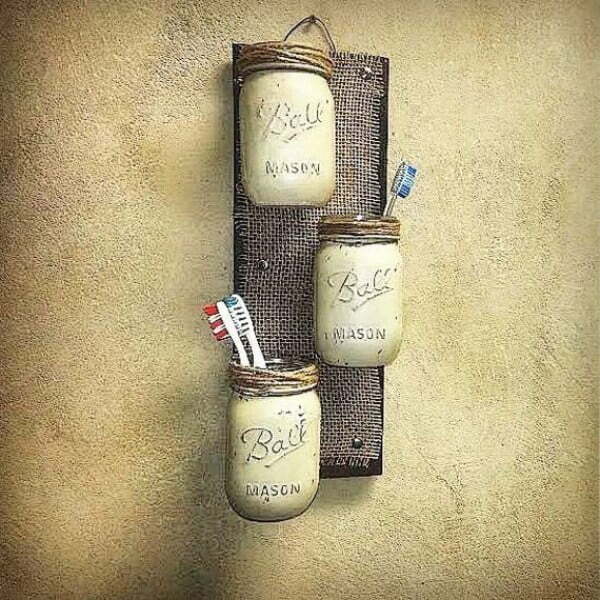 You can make great rustic decor accents with mason jars, and if you use pallet wood (or lookalike) to build it, you get a real decor statement which can transform a small bathroom completely. Check out this version of a wall organizer made with boards from IKEA. It works as a great DIY makeup organizer. There are many ways you can add towel hooks to a bathroom wall, and this is a gorgeous version with repurposed barn wood and big hooks. While it doesn’t take the use of space as a concern, it makes a powerful rustic decor statement if you have room to spare. With some rope and hot glue, you can transform a cheap wire basket into a beautiful rustic bathroom accent. It’s straightforward to build, and the result looks quite fancy. 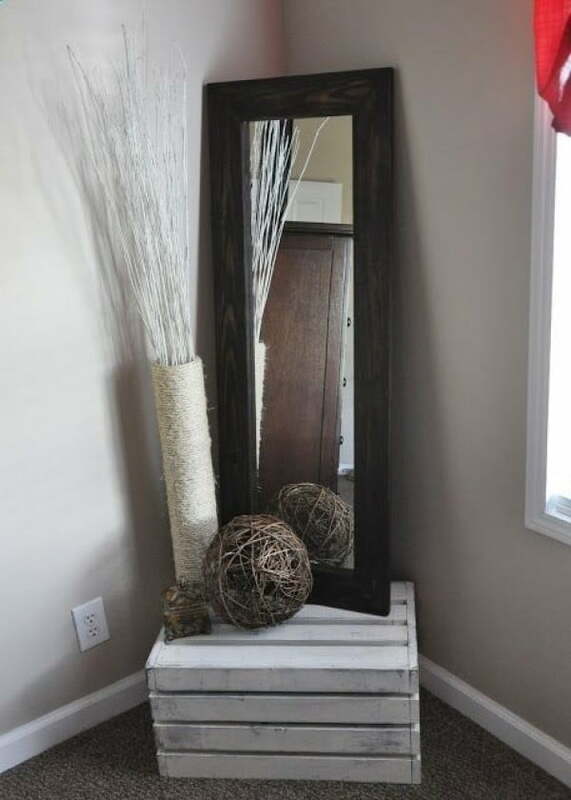 The trash can will not become a decor eyesore ever again. Pallet wood as a material gives you a lot of flexibility to create rustic decor, especially in the form of storage units. Here’s how you can utilize the space over the toilet and make it look terrific. It becomes a space not only for storage but display too. Add some charm to your home decor with beautiful rustic signs over the bathroom door. It’s not so much to guide your guests to the right room (although it certainly helps) as it is to create whimsy in your decor. You can turn a regular builder grade sconce light into a rustic accent mason jar light fixture. It’s an unexpected accent in an unexpected place, and that’s what makes it a great unique decor decision. If you think a toilet paper holder can only have one function, think again. The clever decor is all about multifunctional details and elements, which is what this holder shelf is. It can be used to keep small handy bathroom accessories or to create attractive displays. First seen on Etsy, these adorable rustic mason jar shelves are no longer available for purchase, but you can use the rough idea to build something like this yourself. Check out some of our mason jar projects to learn how to paint and install them. 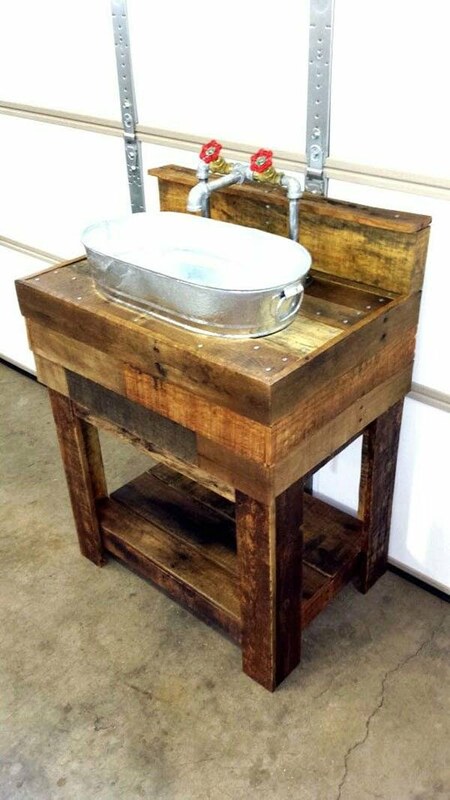 Let’s turn it up a notch with a full out rustic design sink made from a galvanized bucket and pallet wood. Perhaps it’s not a project for everyone, but it indeed is a fascinating design. Rustic through and through. 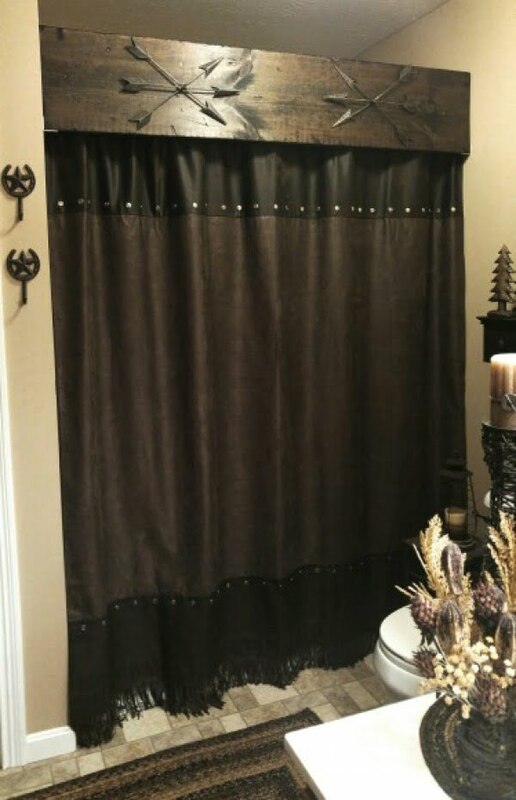 Choosing the shower curtains is a straightforward way to add rustic accents to your bathroom decor. If you add a rustic wood board to cover the rod for a built-in look, it will make an even stronger statement. 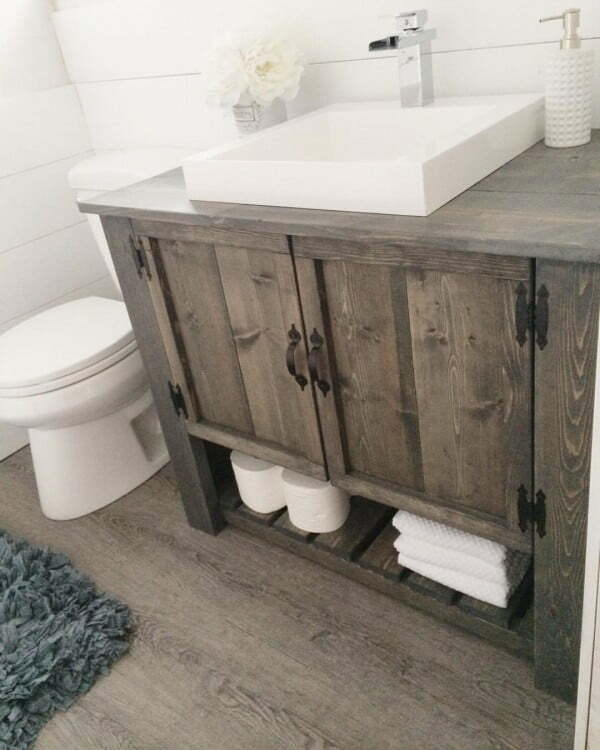 Making a piece of furniture takes a higher level of skill but if you’re one that can pull it off, why not try building a rustic DIY bathroom vanity cabinet. It can easily be the focal point of your entire bathroom decor. Alternatively look for someone to handcraft one for you. 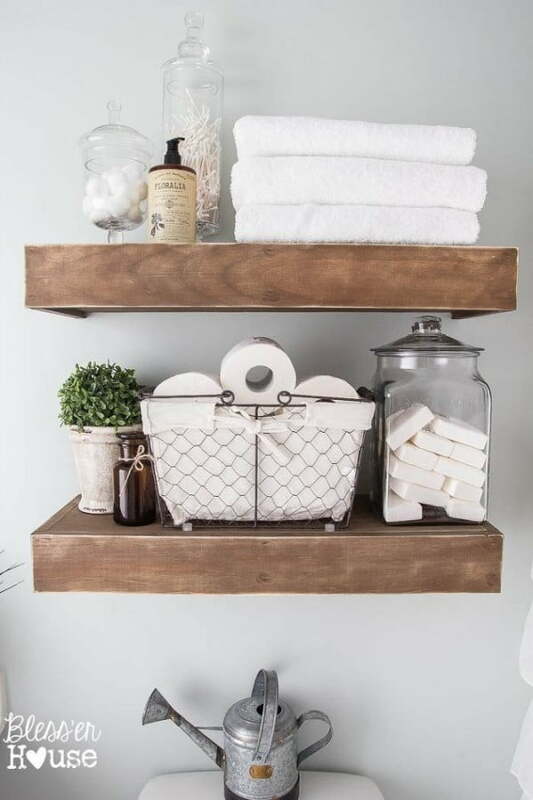 A bath caddy is an easy way to add a rustic accent to your bathroom decor as well as a convenience for your bath time. It’s easy to build from a single board and makes a beautiful warm decor detail. For a strong rustic decor accent, consider making a full plank accent wall. The wood planks add another material into the mix which makes decor look complete, and the rustic finish helps create a warm, cozy mood. 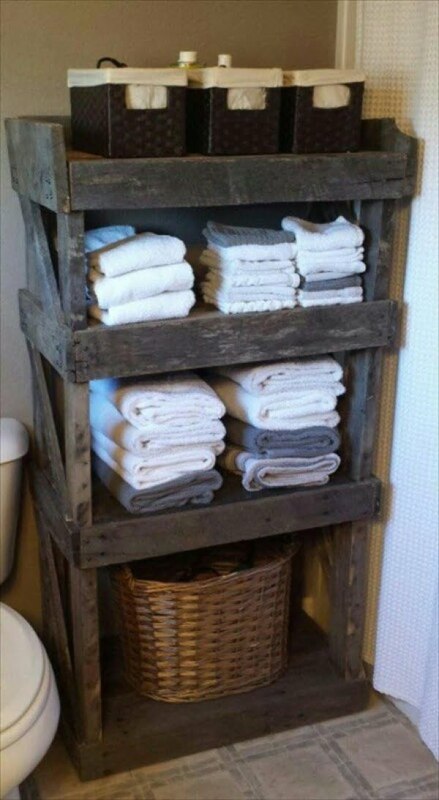 As a way to make use of dead space, add a rustic storage unit by the side of the bathroom vanity. 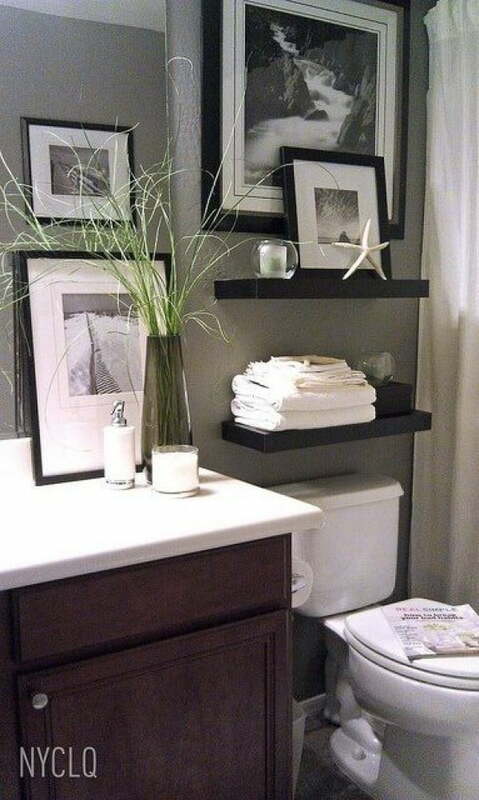 It’s the perfect space to hide unsightly bathroom items, and it makes a great warm accent. 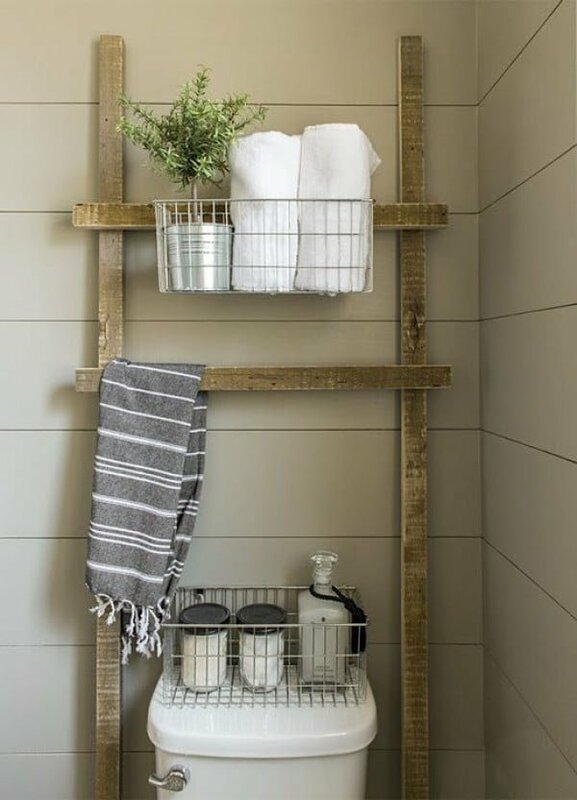 You can add suspended shelves just about anywhere and sprinkle your bathroom decor with rustic accents that way. They’re easy to install, so it’s one of the quickest ways to improve your decor. 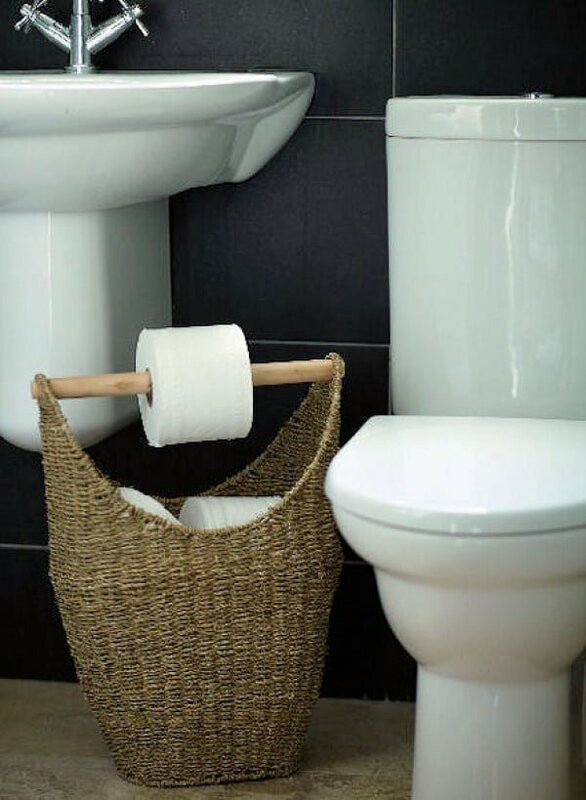 As a very functional and useful decor item, you can use this toilet paper basket as a holder and as a storage unit. Its attractive design will make a pretty decor accent, and you can get a ready-made one or make one using this idea. 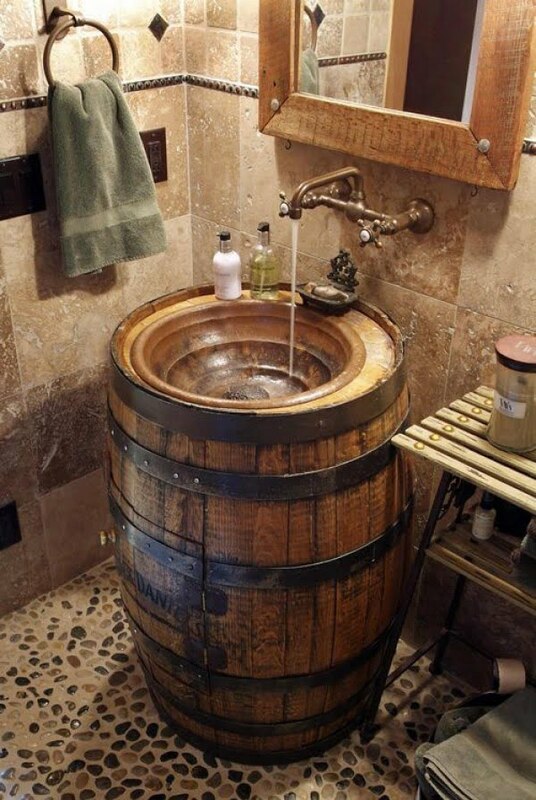 The unique design of this bathroom vanity made from a barrel makes a beautiful focal point and rustic decor statement. It’s certainly not for everyone but makes unique bathroom decor if you go for it. Industrial style often goes hand in hand with rustic, and the combination of the two is always visually enticing. Making something as little as a toilet paper holder is easy but the industrial look of piping will give you a great decor accent. Check out the full tutorial on how to make one. 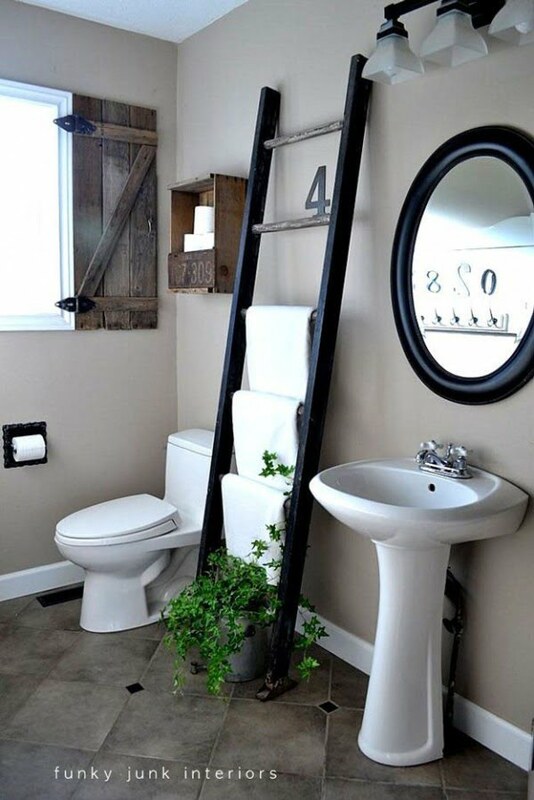 A rustic ladder is easy to build, and it can be used as a towel rack anywhere in the bathroom. It takes little space and can be moved around, so it’s especially useful in a small area. It makes a great warm rustic accent in your bathroom decor too. Check out the tutorial to learn how to make it. Add DIY letters to decorate the walls for an accent and a personal touch. The weathered paint look creates a brilliant rustic bathroom decor accent. We prefer towel hooks instead of bars for two reasons. For one, they make organizing towels so much easier, and secondly, you can use these gorgeous crystal knobs as hooks. Instead of tiles, try using pebbles for some areas such as the shower floor. Since bathrooms are usually small and they require storage for many bathroom accessories, shelves are welcome in bathroom decor. And this is where you can get creative. 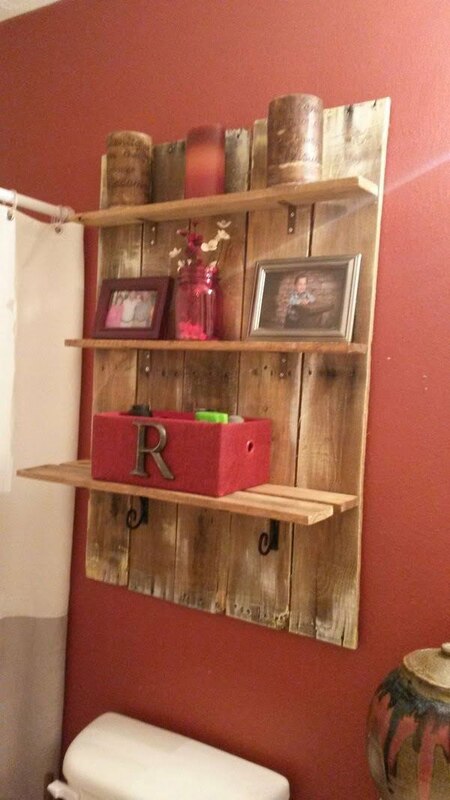 Use (or re-use) wood for nice rustic shelves. Use baskets for a rustic accent. Our beloved upcycled mason jar shelves make an appearance in bathroom decor as well. Crates make great shelves too. 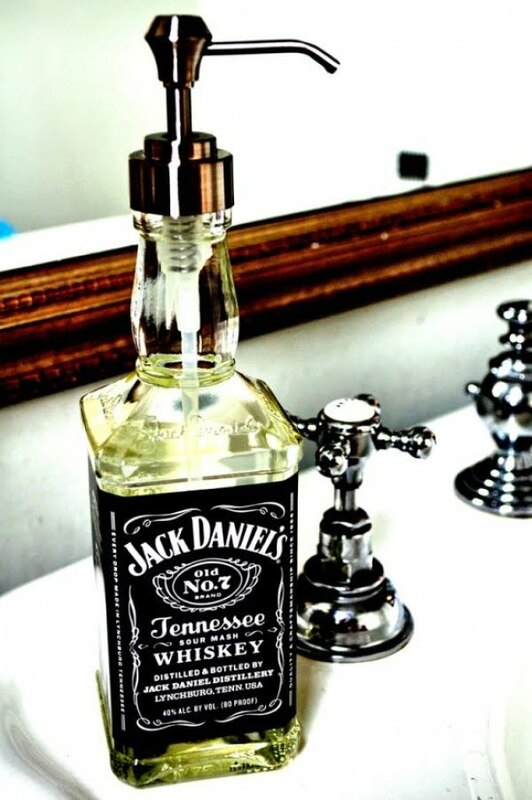 There are many uses for bottles in a bathroom, and you can make it count, such as this whiskey bottle being used as a liquid soap dispenser. Old wooden boxes make great cabinets. Use them for a cheap alternative and a rustic accent. It’s easy to make one out of reclaimed wood too. Ladders make natural towel racks. It doesn’t have to be all functional. Create vignettes for that art deco element. 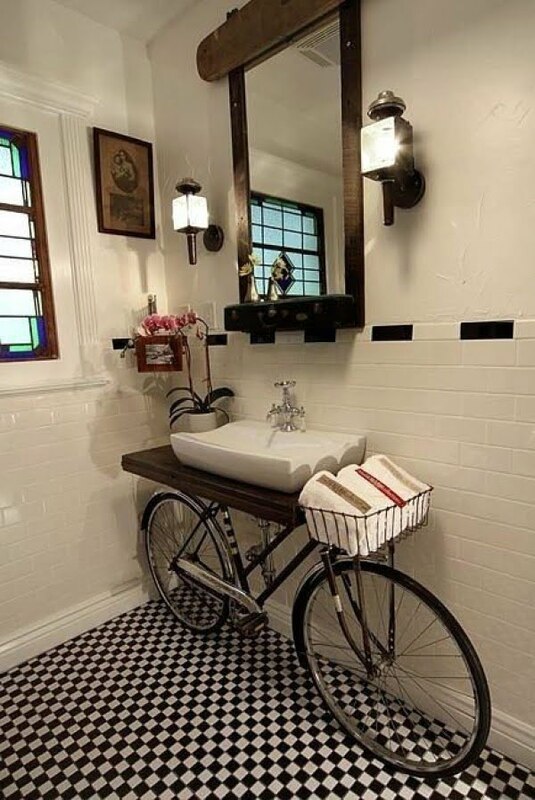 Who would’ve thought that an old bike can make such a beautiful DIY bathroom vanity? Hanging pictures and arranging decorative accessories for display is a great way to make bathroom decor personal. There’s no reason why it should not get the same decor benefits as your other rooms.